Nuclear MADness (Mutually Assured Destruction) is not just a catch phrase from the past. A new nuclear arms race is underway—a clear and present danger to all humanity. And Kansas City is ground zero for the MADness, where nearly all the non-nuclear components of the U.S. nuclear arsenal are crafted. Obscene amounts of resources are being poured into the Kansas City National Security Campus and the NNSA (National Nuclear Security Administration) site office in KC: $716 million in 2018; $761 million in 2019, and a staggering $1 billion being requested by the Department of Energy for 2020! Is this how our generation, how each of us, will be remembered? As the ones who squandered earth’s resources on omnicidal weapons? As the ones who remained silent while civilization’s future was made forfeit? 10 am Witness at Bannister Federal Complex, 1500 Bannister Road, KCMO. Park on Lydia, east of Troost; walk to former Wayne entry on Bannister for short rally re toxins at the former nuke-parts plant. 11 am Gather at Prospect and Mo. Hwy. 150 (park on Prospect) for a one-mile walk to the main entrance to the National Security Campus. 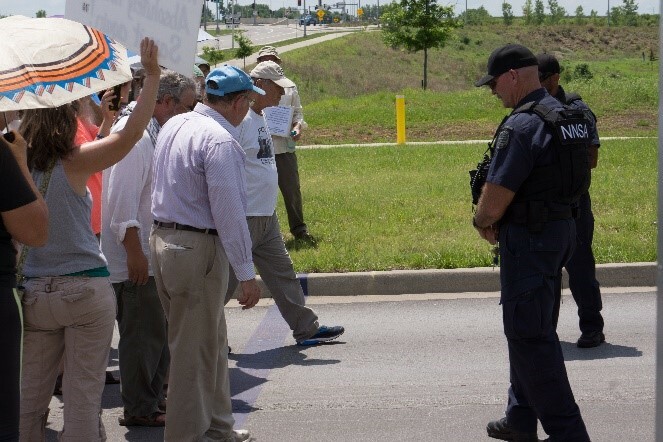 11:30 am Rally at the entry road to new plant, 14510 Botts Rd., with talks from those who intend to cross the line and risk arrest—including our first-ever international peace witnesses, from Europe. Noon Stage a Die-in on the public right-of-way at the entry road, commemorating more than 154 persons who’ve died from the Bannister plant’s contaminants, and those who may die in future nuclear attacks. 12:15 pm Cross the property line to protest nuclear weapons, with detention by the guards or police and with continued witness by those not crossing the line. This Memorial Day, let’s honor the masses who have died in war by standing against weapons of mass destruction!